Detective Mac Adams of the Richmond Police Department is responsible for a lot of good things: stopping crime, organizing on behalf of nonprofits and singlehandedly rescuing nearly half a dozen deaf dogs. 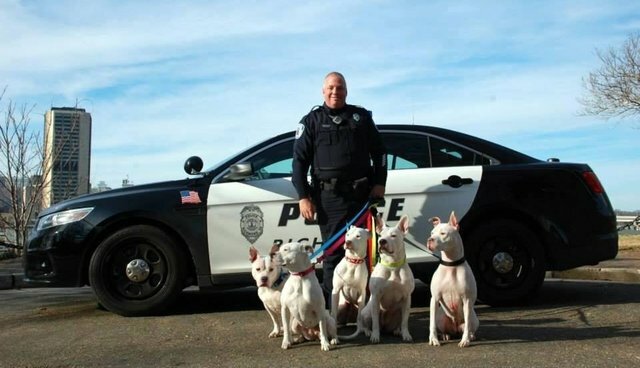 Adams was recently photographed alongside his five canine companions -- four of which are pit bulls, all of which are deaf rescues -- for an album on the department's Facebook page, which went viral after people saw the detective with his pets. According to Adams, he and his family began advocating for deaf dogs after adopting Pickles and realizing just what the dog's life would have been like without their help. "A lot of [deaf dogs] go un-adopted and end up in shelters for a long time and may be euthanized," Adams said. "The best lesson I have learned is that their disability (as some call it) is no disability at all, and I think it makes them a better dog." Adams also said that adopting pit bulls has made him more cognizant of negative stereotypes about the breed, which he tries to correct in his role as a police officer. "I have met many gentle, calm, good natured Pit Bull type dogs since getting my guys," he said. "They are truly a great breed that has been used by an portion of the population for nefarious purposes and the breed, not the people, have suffered for it." Recently, Adams was invited to join the board of Deaf Dogs Rock, a nonprofit organization that advocates for deaf and rescued canines. You can read the rest of his interview about his dogs on the RPD Facebook page.